While not a new concept for Leaf, 2017 Leaf Best of Basketball Unopened Edition marks the format's debut on the court. Taking the buyback idea to sealed wax, each box delivers one factory-issued box from the sport's past. Instead of the normal buyback cards, 2017 Leaf Best of Basketball Unopened Edition goes a different route. The sealed box inside the box is a mystery, but all options are from the last two decades and, obviously, specific to basketball. Leaf promises that among the choices are "some of the hobby's most desirable and iconic releases." 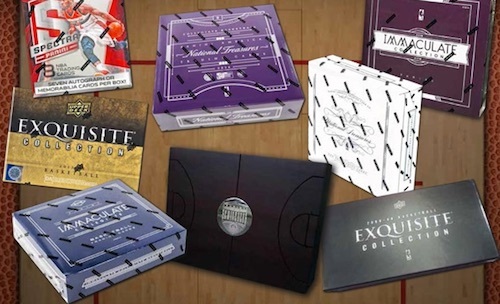 Although we don't anticipate a full list of the products included, the 2017 Leaf Best of Basketball Unopened Edition sell sheet teased sets from powerhouse brands like Upper Deck Exquisite Collection, Panini Immaculate Collection and National Treasures Basketball. In addition to the sealed box, 2017 Leaf Best of Basketball Unopened Edition contains one Super Swatch relic card in every box. There are six boxes to a case. Leaf also makes a card-based product under the "Best of Basketball" banner, including one for 2016-17. Please note these are mock-up images and are not final cards. Contents and designs are subject to change. RARE SEALED 2016-17 Panini Prizm Basketball Jumbo HOBBY Box - Simmons Silver ??? I love products like this. Too many scam artists trying to make repackaged products and it’s good to see Leaf still owns the market. Avoid the scammers like Boom Box and buy this. Awesome product.